An Italian truck driver has spoken of his miraculous escape when the Morandi bridge in Genoa collapsed on Tuesday, killing at least 38 people. Luciano Goccia had parked up right underneath the motorway bridge on Tuesday morning and had just opened the door when he heard an 'explosion' above him. A rush of air threw him several feet backwards and into a wall, just as a huge slab of concrete came down and crushed his vehicle. Mr Goccia escaped with a few scratches and a minor injury to his arm in the incident that killed dozens of people - while his truck is heading for the scrapyard. 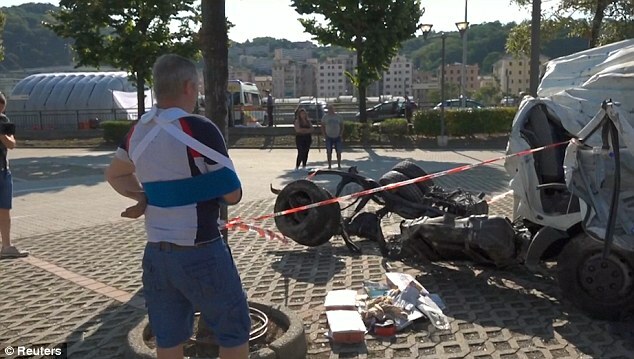 He said: 'I had just arrived underneath the bridge, I opened the truck door to get out and I heard an explosion. 'When I turned, I was thrown through the air and hit a wall and I lost my breath. 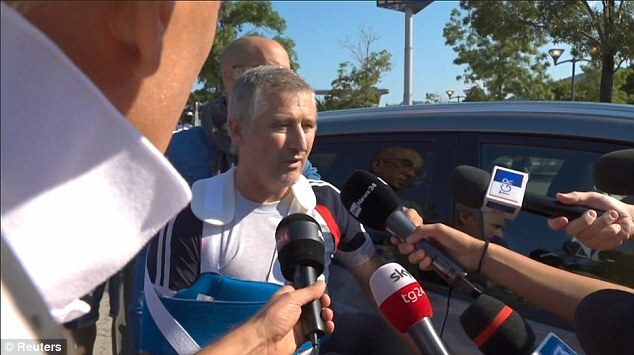 With his arm in a sling, Goccia said he felt amazingly well considering what he had been through. Examining his completely destroyed truck that had been recovered from the debris of the ruined bridge, Goccia said he still found it difficult to look at it and see what he had been able to survive. Other survivors of the disaster have shared their stories of how they managed to narrowly escape death when the bridge collapsed at 11.30am on Tuesday. Another witness, only named as Ivan, 37, said he watched the pylons come down as if their were papier-mache, before he was evacuated from the nearby building where he works. 'I can't tell myself that this is real, I still feel like this is a movie,' said Francesco Bucchieri, 62, who watched the disaster unfold. Both families of victims and government ministers have blamed the disaster on a lack of maintenance by Autostrade Per Italia, the private company that operates many of Italy's toll highways. The Morandi bridge in Genoa collapsed around 11.30am on Tuesday while it was packed with commuters, truck drivers and holidaymakers all making their way through the busy port city. The dead come from all walks of life and all corners of the globe, united by nothing other than the fact that they happened to be on the same 650ft section of bridge at the fateful moment it came crashing down. Matteo Bentornati, a freelancer videographer, Giovanni Battiloro, Gerardo Esposito, and Antonio Stanzione were due to fly to France but chose to drive instead at the last minute. The foursome were due to spend their holidays shuttling between Nice and Barcelona but never made it over the border from their home county. Andrea Vittone, 49, his wife Claudia Possetti, 48, and their children Manuele and Camilla Bellasio, aged 16 and 12 were all in their black Volkswagen Golf together when it plummeted with the bridge. The couple married just three weeks ago and were taking a family holiday to the Sea of ​​Sestri Levante from Pinerolo, since they had a few days of holiday left after their honeymoon in California. Roberto Robbiano, his wife Ersilia Piccinino, and their eight-year-old son Samuel, who was one of the first to be found in the rubble, all died when their car fell 150ft. Mr Robbiano, a computer technician, married his wife in 2014 and frequently posted photos to his Facebook of his young son and the black-and-white family cat on adventures at home and on holiday. He posted that they were excited to head to the seaside, their car laden with beach toys for Samuel to play with in the sand. Their crushed car was found under the remains of a concrete beam, along with the boy's Spiderman ball. Alberto Fanfani, 32, an anesthesiologist, and his fiancee Marta Danisi, 29, a nurse, were also pulled from the rubble. The pair were engaged and due to marry next year. The Mayor of Sant'Agata di Militello, Bruno Mancuso, announced a day of mourning on Facebook. 'I am shocked and saddened by the terrible tragedy that struck one of our fellow citizens, the young Marta Danisi, who died as a result of the collapse of the Morandi Bridge in Genoa,' he wrote. Bruno Casagrande and Mirko Vicini, who both worked for environment agency Amiu were both crushed to death, as was Alessandro Campora, 46, who was employed by private firm Aster. 'The damages are invaluable but nothing compared to the pain for the lives lost,' Amiu director Tiziana Merlino said. The firm shut down work in the area indefinitely. Mr Casagrande and Mr Vicini were looking forward to a better future after a period of unemployment was ended by recent seasonal contracts with the firm. Stella Boccia, 24, was buried in the wreckage along with Dominican boyfriend Carlos Jesus Truillo, 23, a waiter. 'We apologise to our customers, but we will be closed for mourning. Unfortunately a piece of our hearts remains under the rubble of the Genoa bridge,' Ms Boccia's mother wrote upon hearing the news. The pair had not been dating long, meeting by working on the same street, Ms Boccia at a restaurant and Mr Truillo at a Foot Locker store yards away. 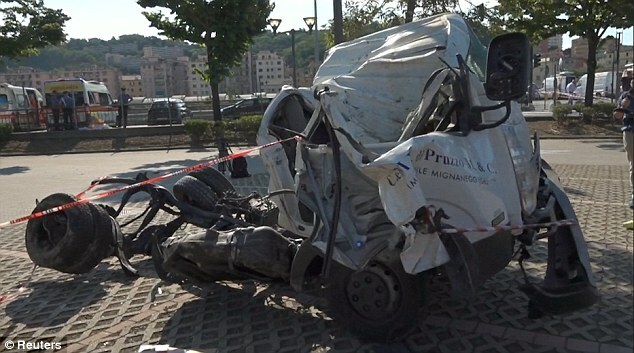 A young French couple - Nathan Gusman, 20, and Melissa Artus, 22 - who were driving from Montpellier in France to Sardinia on a route that took them across the bridge were killed along with Axelle Nemati Alizè Plaze, also 20. Elisa Bozzo, 34, used her Facebook page to write 'how can I not celebrate life!' not long before the tragedy, but on Tuesday desperate friends were using the same site to appeal for her whereabouts. The search was in vain, however, as she was pronounced dead on Wednesday morning. Also pulled from the rubble were the remains of Juan Carlos Pastenes, 64, a Chilean chef who had lived in Italy for three decades, along with his wife Nora Rivera. Juan Figueroa, 60, a fellow Chilean, who had lived in Italy for at least two decades, was also killed. Marian Rosca, a 36-year-old truck driver from Romania, was living and working in France to save up money to get married and build a house for his new wife back home when he died. Marius Djerri, 22, and Edy Bokrina, from Albania, were in a van on their way to a cleaning job when they perished. Luigi Matti Altadonna, 35, a father-of-four who sold computer games, was completing his last delivery of the morning when he plunged to his death inside his work van. 'The municipal administration joins the pain of Giovanni, a model citizen and an exemplary volunteer of the Civil Protection Section of Borghetto, for the loss of his dear nephew in the terrible tragedy of Genoa'. Mayor Borghettino Giancarlo Canepa said. Mr Altadonna was driving his work van over the bridge when it collapsed under him. Rescuers scrambled to free him from the wreckage but he could not be saved. 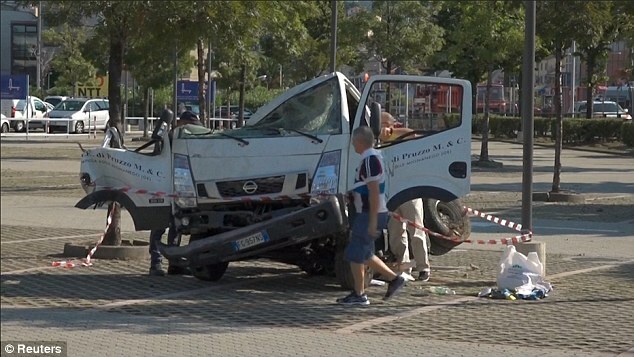 Colleague Gianluca Ardini, 29, who was riding in the van with him and is due to become a father next month, escaped with only a dislocated shoulder after clinging on to metal wires. Gennaro Sarnataro, 43, a father-of-two and truck driver, was also killed on the bridge as he returned from a fruit and vegetable delivery to France. 'He was a great worker, a decent person,' his family said as they identified his body at the morgue. 'Genoa Club Portuali Voltri rallying around Andrea's family, our associate, our friend, our colleague, victim of Ponte Morandi's tragedy,' his football club wrote on its Facebook page. Giorgio Donaggio, a motorbike champion, father-of-three, and boat-builder, was mourned by Italian celebrity cyclist and TV presenter Vittorio Brumotti, who credited his 'great friend' with helping to launch his career. 'My great friend Giorgio Donaggio, himself a motorcycle trial champion, was lost in the Genoa bridge disaster. He's been my idol since I was a child and it's also thanks to him that I am what I am today. RIP Super George,' he wrote. Alessandro Robotti, 50, was the son of a doctor and until recently manager of the municipal pharmacy of Arquata, and one of the founders of a group of astronomy enthusiasts. 'Now you can see your beloved stars up close,' a tribute on his Facebook page read. His wife Giovanna Bottaro, 43, who worked for Capriata D'Orba, is still missing but presumed dead.